“There are good reasons to suspect that a new valuation range may have evolved” for U.S. stocks, Jim Paulsen, Leuthold Group Inc.’s chief investment strategist, wrote in a report Monday. 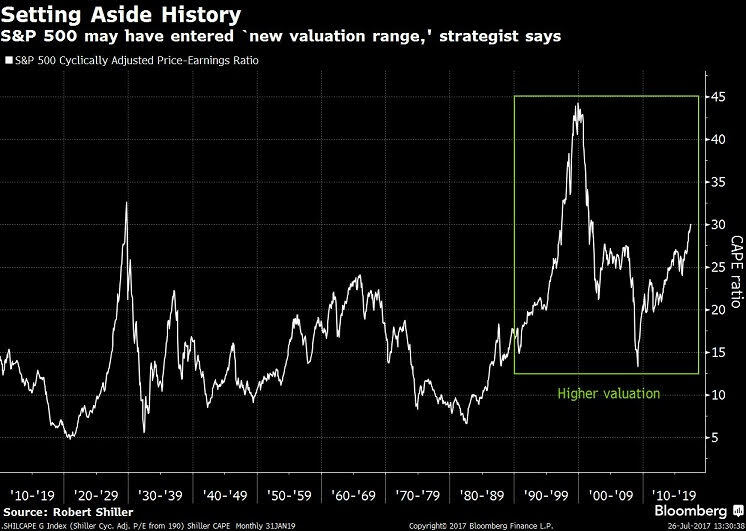 Paulsen highlighted an increase since the 1990s in the S&P 500 Index’s cyclically adjusted price-earnings ratio, based on average annual profit over 10 years. The shift reflects a less cyclical domestic economy, more stable inflation, a more growth-oriented stock market, a wider range of investors and the growing popularity of index funds, he wrote.